It breaks my heart to hear that [nosh], the newest concept of Rob and Janet Henry, has now closed it's doors. Salemites can guess, speculate and judge or they can admit that none of us can know all of the details of another person's life. Personally, I hope the Henrys are able to get through this difficult time and eventually come back into the restaurant business. I hold all of our local business owners in the highest regard. It's not easy putting your dreams out there for others to praise or trample over. And let's not forget the strain the weak economy has put on everyone's budgets. If they do return, hopefully we'll all be in a forgiving frame of mind, instead of a mud slinging one. and work ethic is unmatched. This is very sad news! Hate to see them go. I had WBC ranked number 1 on my list of "Best Burgers in the Valley" on a couple of other websites. I once was a victim of unpaid wages (company owner got herself arrested in Haiti trying to smuggle kids across the border) and I have no sympathy whatsoever for Janet and Rob. Dudes, Salem is too small of a town to pull this kind of stunt. Wages need to come first in any business before any other debt...I hope like crazy this is all a huge misunderstanding and things will be resolved quickly. I have spent many incredible evenings in both WNC and WBC and it's sad that this might be what everyone will remember about Janet and Rob. I was thinking about trying Nosh, but if this is true about not paying their employees, then I cannot go in good conscience. The Statesman Journal is now reporting Nosh is closed too. Hang in there Rob & Janet. 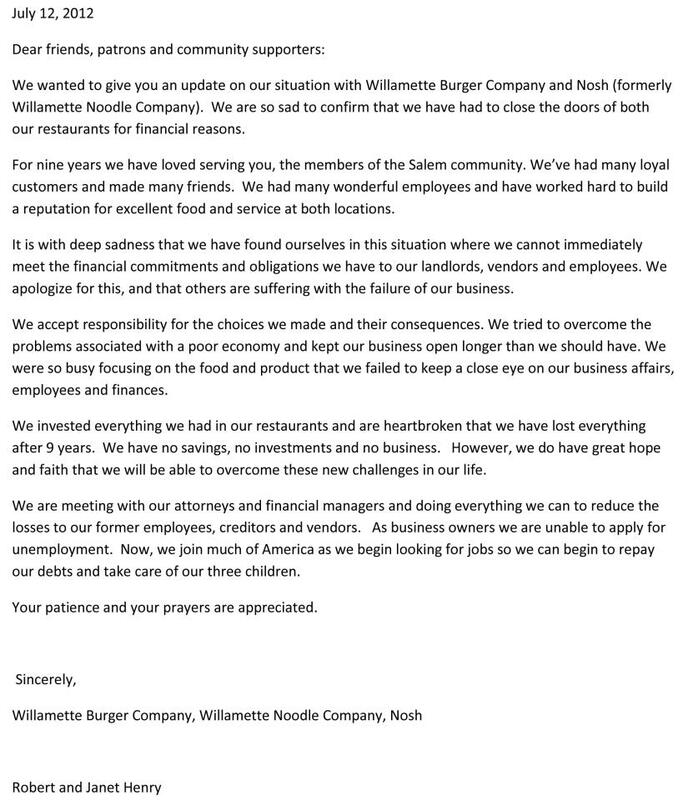 This makes me sad for all involved -- the employees who were laid off unexpectedly apparently without payment; the owners, who seem well-intentioned and probably never expected to be in this awful situation; and the community, which has lost two unique and fun restaurants, which are in short supply in Salem. Except I think Salem still has some great restaurants. Many more good choices than when we moved here in '91. So sad for all involved... Hoping that they can resolve and come back to Salem soon. 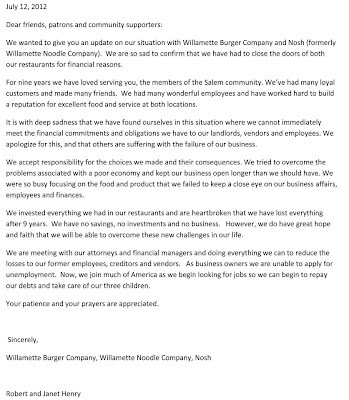 I hope the owners were well intentioned, but having owned several small businesses I can tell you that the well doesn't just suddenly run dry in a matter of days without some sudden catastrophe like a fire or embezzlement. I pray there hasn't been a catastrophe, though. I hope we hear from them soon on this blog to know they're ok. The food was simply divine at WNC and WBC, though I had several poor reviews from the new nosh thing. I hope they come back with the same ingredients and attention to taste they had at the WNC - they'll have my business. I don't mean to kick them while they are down, but something does't make sense. How can they go from retooling their business to being completely bankrupt? Wouldn't they have known that before making such a drastic change? I hope they can get out of the hole they have dug, but I do not believe they are being truthful about the reason. Just my two cents. That term "remodel" sounds major, doesn't it? But when N and I went in after the space became [nosh], the only changes we noticed were a fresh coat of paint and a bench that ran across a back wall--nothing fancy, nothing big. They knew they were having issues filling the place up during the week, so they figured (I may be making a big leap from what I heard from the two of them before this happened)they might as well change the concept and menu to make it something they enjoy. The menu still sported the main favorites from the Noodle, along with seasonal specials, so again, the changes were minimal. To sum up, I do believe they're being truthful. No, it doesn't just dry up right away. But if things start to trend down, I don't know a single business owner who is quick to say, "Well, let's stop this right now!" No, they pour themselves into it x2, and try new things, move things around, shake things up, all in hopes of turning it around. The outcome is usually an upsurge, or a crash. I'm sad to see the latter seems to have been the result here. Very sad, indeed. I really respect them for releasing the statement and really putting it out there. Given the family gave the community nine years of good eats and some of the best places to take people when they visited to show them that Salem is pretty cool. I feel for them, as they are probably in a hole, and it's often not easy to find a job after being self employed. They gave us their all, and in return, Salem went to McDonald's (and Burger King, and Carl's Jr, and Jack in the Box, and...). I wish them the best, and hope to see them again. They moved to Siberia out on Portland Rd, and into space that had so many things going against it. I've lived in Salem for 30+ years and have been on Portland Road maybe 5 times (avoid at all costs). The layout was akward. Had they been on a major throughfare, near pockets of population that have a higher amount of disposable income (downtown, west salem, South Salem) they would have had a much better chance of being sucessful. For instance the bakery d amor site. Or the old Spaghetti Warehouse site (needed big $$ to improve, but so much potential and 35,000 cars going by at peak hours). Maybe where the Fussy Duck is. Out near Northern Lights. Etc. 2. The Noodle Company was an ok location. I think they did relatively well there, but any of the aforementioned locations for WBC - I bet there would have been a line 7 days a week for dinner. The Noodle Company suffered from management issues. The servers were not well trained and I have a big problem with servers going out for cigarettes during their shift. There never seemed to be anyone in charge. The servers were adequate, but good restaurants have great servers. This was one of those places that I really had to think hard about the tip: the service wasn't bad, but just not very good. Beer was never cold. Nothing more depressing than ordering a beer and it's delivered at 50 degrees. The decor was pretty bland. Lighting was similar to an office (not comfortable). The Noodle Company served good food. Never had a bad dish. The Burger company served a good burger and tots, even though I didn't care for the seasoning on the burger. That is my honest assessment of these two places. I wish the owners well going forward. Just ran across the WBC menu in a drawer and wondered where they'd moved this time. I'm sorry to hear they are no longer in business. As a former small business owner sometimes you can have a wonderful product but not be so savvy with business itself. Moving by the fairgrounds was probably a bad idea. That location lacks adequate parking due to the shop next door. I've felt badly for every restaurant that has relocated there because it appears you can only park about eight cars in their lot. Maybe they could do Saturday Market?